The fourth-wall-breaking of “metatextual Emp,” as seen here, really does have its fans. (The most recent volumes of Empowered have offered few such opportunities, I’m afraid, as the longer stories of the last few installments cut way the hell back on the number of title pages.) 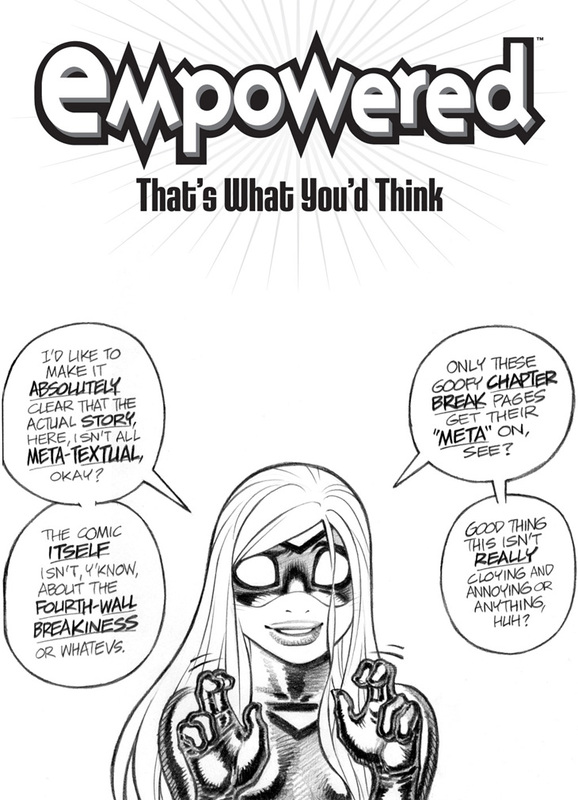 Some readers have gone so far as to ask about the possibility of an Empowered one-shot or story that would be consist of nothing but “meta Emp" directly addressing the reader. I’m a tad leery of the idea, though, as I’m presently super-duper-ultra-paranoid about the very real risk of “overdialoguing,” an occasional flaw of my writing that I dare not indulge.